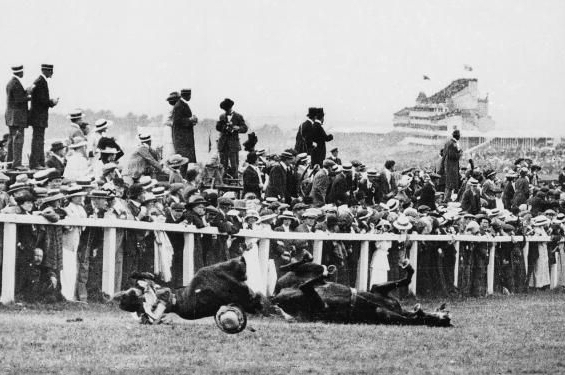 On 8 June 1913, Emily Wilding Davison died after stepping out in front of King George V’s horse at the Epsom Derby. Emily Davison was a member of the Suffragette movement, which fought for women’s right to vote in the UK. Before 1918, women were not allowed to vote in parliamentary elections. 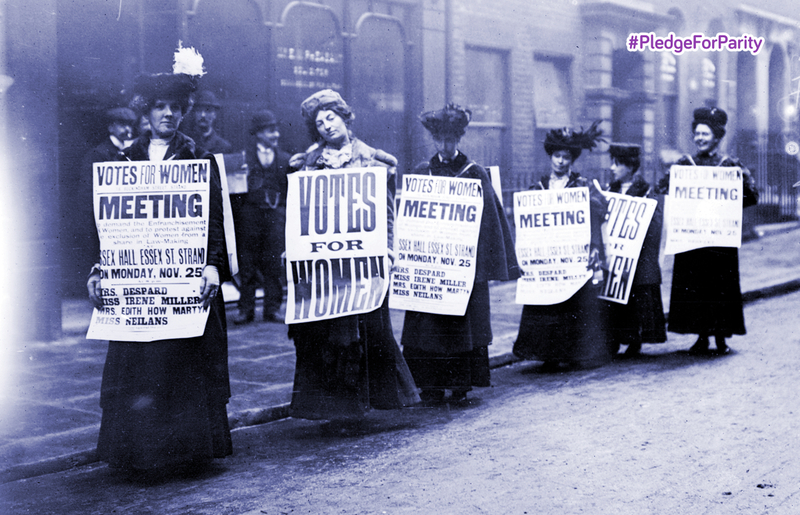 In the early 20th century, activist groups united and fought for women’s right to vote (‘suffrage’). The term ‘suffragette’ was first used by the Daily Mail in 1906. It was intended as a derogatory name for an activist group run by Emmeline Pankhurst and her daughters. 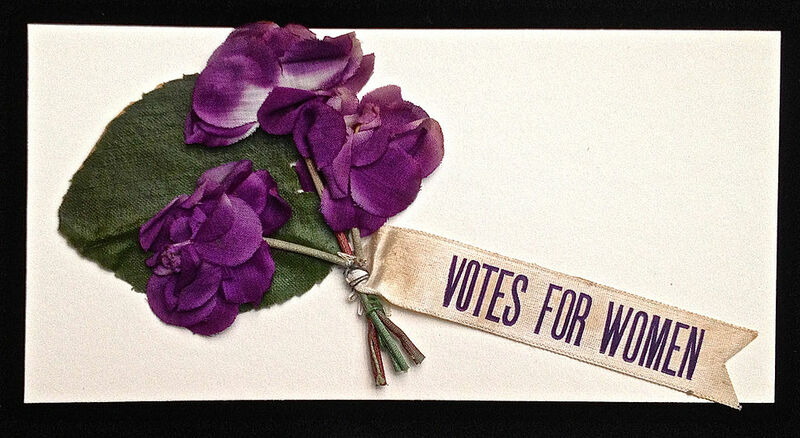 The Suffragettes rejected political powerlessness and engaged in a campaign of public protest. These protests sometimes involved violence – ranging from window breaking and arson to bombings. Many Suffragettes were imprisoned. Several went on hunger strikes in protest, and were force-fed by prison authorities, suffering treatment which could nowadays amount to a breach of the right not to be tortured or subjected to inhuman and degrading treatment. Parliament even passed a law known colloquially as the ‘Cat and Mouse Act’ to deal with hunger striking Suffragettes. This law allowed for the early release of women who were so weakened by hunger striking that they were at risk of death. They were recalled to prison once their health recovered, so the process could begin again. Emily Davison was a Suffragette. She was jailed nine times and force-fed 101 times. She stepped in front of King George V’s horse at the Epsom Derby on 4 June 1913, suffering fatal injuries at the age of 40 years old, and became a martyr to her cause when she died four days later. Her gravestone bears the motto of a suffragist group, the Women’s Social and Political Union: Deeds Not Words. Why it’s important to remember the struggle for women’s votes. The right to vote and stand for election is recognised as a fundamental human right under Article 3 Protocol 1 of the European Convention on Human Rights. Women have been denied this right around the world for centuries, so it is important to celebrate their achievement of it. In 2018, it will be 100 years since women won the right to vote in the UK. In fact, in 1918, only women aged over 30 years old (who also met a property qualification) were given the right to vote. It took another ten years to achieve full voting equality. But the fight for gender equality continues. Equal pay and opportunity have not yet been achieved. Between them, all the men in the UK earned £516 billion last year, but all the women together earned just £272 billion. Women in the UK and abroad are still subject to harassment and violence. Take a look here for further facts and figures which show that we still have a way to go for gender equality. Nonetheless, there have been some recent achievements. Thanks to the campaigning of several parties including feminist activist Caroline Criado-Perez, recently-elected Mayor of London Sadiq Khan has agreed to a new statue commemorating the Suffragettes’ victory. Criado-Perez’s petition to erect a statue of a Suffragette to mark 100 years of female suffrage received over 70,000 signatures. She also successfully campaigned to have Jane Austen featured on the new £10 note, pointing out that, as Winston Churchill replaces Elizabeth Fry on the £5 note from 2016, there would otherwise be no women (apart from the Queen) on sterling bank notes at all. The fight for women’s rights is no less important today than it was 100 years ago. In memory of the Suffragettes’ struggle, we celebrate efforts to ensure that women are equally represented in public life and receive equal protection for their human rights. Learn more with our post: 7 Reasons We Still Need To Fight For Women’s Rights and our infographic poster on the right to vote. Read about the importance of equality with our non-discrimination poster and our other equality resources. Featured image © RV1864, used under Creative Commons Attribution-NonCommercial-NoDerivs 2.0 Generic Licence. Second image credit: International Women’s Day campaign 2016. Third image © Djembayz, used under Wikimedia Creative Commons Attribution-Share Alike 3.0 Unported licence.